The PSS shaft seal eliminates all the problems of the old sytle stuffing box by using a concept employed on military vessel and thousands of European yachts for years with perfect reliability. The PSS system gives you a NO Maintenance, NO Drip answer to your stuffing box problems. How the PSS system works? The reinforced rubber bellow is secured at one end to the shaft log and at the other to a high density carbon flange. The bellow, and the water pressure, force the carbon flange against a polished stainless steel rotor which is mounted on the shaft and secured in place by a pair of stainless steel set screws. Two O rings are used to prevent water from leaking between the shaft and the stainless steel rotor. When the shaft rotates, the stainless steel rotor turns against the carbon flange; the high polished carbon reduces friction to a minimum and eliminates any possibility of leakage. Available to fit any metric or imperial size shaft between ¾” (20mm) & 6” (150mm). The Tides Marine Sure Seal system is a water tight, self- aligning shaft seal. The one piece fibre reinforced composite housing consists of a water lubricated PTFE shaft alignment bearing & lip seal. Once the bearing is on the shaft, the risk of misaligning the Sure Seal is reduced. The housing is connected to the stern tube by means of an articulating hose which means there is no measurement required resulting in very simple, self aligning fitting. The hose reduces side loads to the Sure Seal when shaft misalignment occurs, extending the life of the bearing and lip seal. 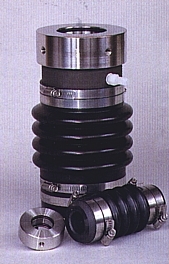 Spare lip seals in a special carrier case can be installed on the shaft at the time of installation. This allows for a simple change out of the lip seal if it should be damaged. Sure Seal can be easily fitted as a replacement for traditional packed glands or to upgrade from face seals.